Bio Notes: Robert Morham was born in Edinburgh on 31 March 1839, the son of Robert Morham, 13 Lauder Road, Grange, which was to be his home throughout his life. In his earlier years he styled himself Robert Morham Jun. He was educated at Newington Academy and at the High School. About 1854 he was articled to David Rhind and remained with him for five years before transferring to the office of David Bryce where he spent three years. During that period he attended the Watt Institution and School of Art and studied at the Trustees' Academy. About 1862 he moved to London to widen his experience and spent four years with William Eden Nesfield, although there is little sign of his influence in his architecture. In 1866 he returned to Edinburgh as principal assistant to David Cousin and was briefly his partner until Cousin's retirement in 1873. He then succeeded as City Superintendent of Works. In the same year he married Anne Isabella Cunningham, daughter of Patrick Brown Cunningham, with whom he had five sons and one daughter. 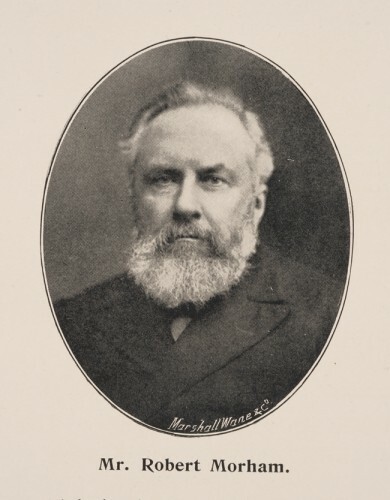 In his later years Morham relied heavily on assistants, James Anderson Williamson becoming Deputy Architect in 1898 and succeeding him in 1908. He died on 5 June 1912, leaving moveable estate of £10,768 15s 6d. His brother George practised as an engineer and surveyor. 1889 Edinburgh City Chambers Edinburgh Scotland Committee Romm A. 1892(?) Waverley Station, Ticket Centre, Waverley Bridge Edinburgh Scotland Rebuilding (date not given by HS). Possible rebuilding of 1868 Station building by James Bell to form railway agents office. 1897 Clubhouse Edinburgh Scotland Anderson working under Morham who was the City Architect.